Please note this is at The Hotel Wailea, which is different than The Grand Wailea. Pre-requisite-None; some floor yoga experience is advised. 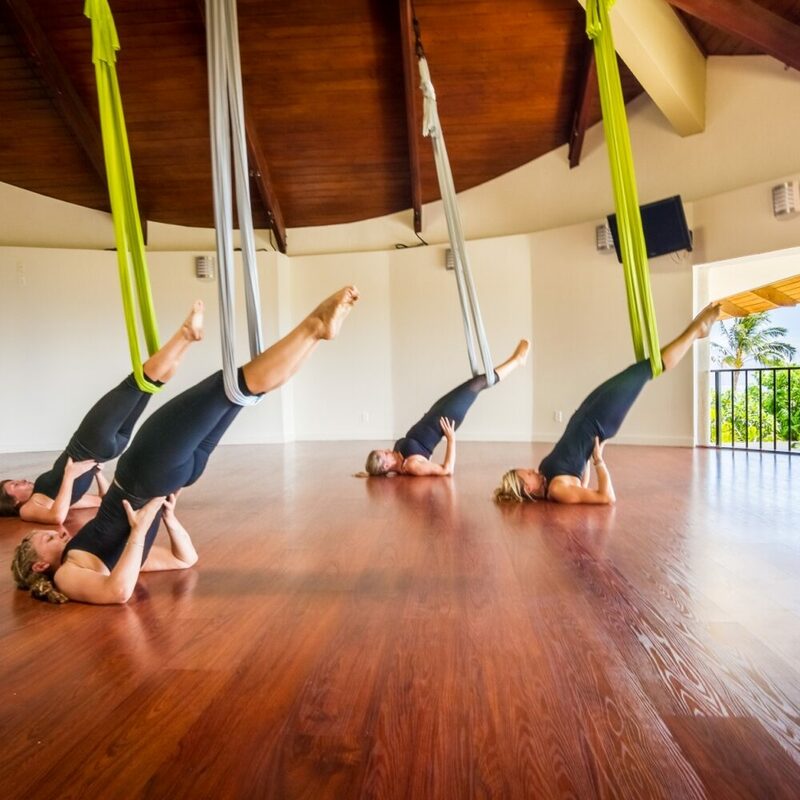 A gentle introduction to aerial yoga for beginners or those wanting a more gentle practice; You will learn beginner level postures using the sling and experience the benefits of some of the basic fundamental postures. Gentle for any ability. Gentle opening movements to warm the body, followed by some deep longer holds, using the sling and the breath to help the body release and open. This will help you stretch and lengthen tight areas of the body and will have you leaving here feeling longer and more open. Great for beginners and those with more experience as there will be plenty of options for those who have more experience as well as modifications for those who want a more gentle practice . This class is very gentle and relaxing. Sometimes the instructor will opt to put the silks low to the floor and use them as a prop for ou to relax and support the bod with long holds and deep breath work. Other times the silks will be a little higher, allowing for more inversions and different postures, but all of the postures in this class are gentle and easy for any one. You will leave feeling completely melted. This class provides some more challenging postures, and will use the sling to work your core, arms, and total body strength. You will leave feeling completely worked. This class provides a mix of some strengthening postures and some lengthening postures to get a nice balance of working a muscle group and then lengthening that muscle group. 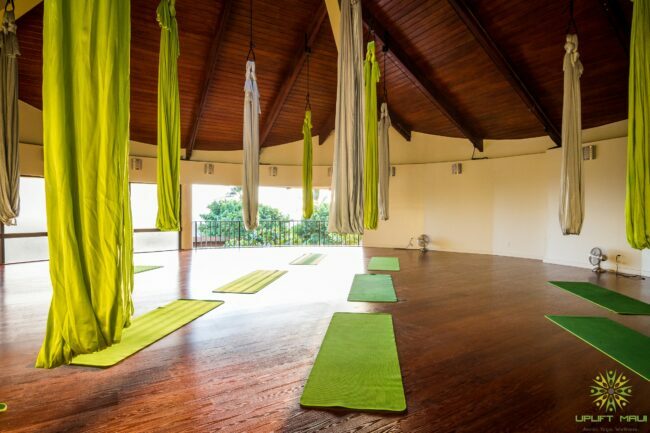 A mixture of body weight training blending Mat Yoga, Barre work, and Aerial Suspension training. This class is great for all levels and abilities and will be a nice challenging workout. 60 minutes. Level 2/3. Prerequisite: 5 prior aerial yoga classes or instructor permission. 5 week series class that meets 1x/week. 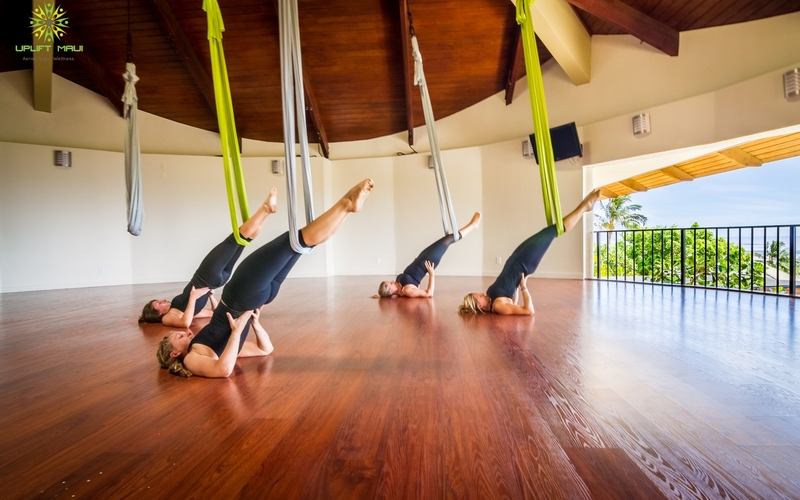 This a fun and challenging class that combines aspects of aerial yoga with aerial dance. We will take postures on the sling and utilize creative transitions and movement to flow from one posture to another on the floor and in the air to create a dance to a choreographed piece of music. Each week we learn a little more of the sequence, add on, and refine it! No dance experience needed! Level 1- No experience required. We will use Aerial Silks to learn fundamental techniques like how to climb, some foot wraps, and more! Then we will progress and learn to use these techniques to create simple combinations up in the air. Level 2 Some experience required. Once you have taken the Beginner I series, then we progress and move on to a new series where we continue to build upon the skills learned in the previous series; progressively getting more advanced in the skills and the strength needed to continue. Level 3- Experience required-Instructor permission to enter. In this class, we will use low to the ground, single-point trapezes, which allow for gentle swinging and movement in combination with the floor. You will learn basic moves and movement on and up in the trapeze.